I have been involved in medicine now for almost half a century as a researcher, student, clinician, teacher, lecturer, author and advocate at the local, state and federal levels. Over this time, I have taught tens of thousands of students and doctors, authored or co-authored 11 books, written over 100 articles in scientific journals and cared for tens of thousands of patients either directly or indirectly through sophisticated corporate wellness programs I designed and helped implement. During this time, I have seen a relentless increase in chronic disease and dramatic change in why people are becoming chronically unwell. For much of the twentieth century, the primary causes of chronic disease were nutritional deficiencies and excesses. We all know about the problems with excessive sugar, nutrient-poor food and unhealthy fat consumption. However, starting about 60 years ago, something fundamental changed. When I first started in medical research way back in 1970, diabetes was rare. In clinical practice in the late 1970s, every year I would only see just a few patients with either Type I or Type II diabetes. But now it has become one of the most common diseases seen by doctors every day affecting around 15% of the population. Taking care of people with Type II diabetes has become the most expensive of all diseases accounting for a whopping 14% of healthcare expenditures. Almost all the diabetes-inducing toxins are new to nature chemicals created by researchers to provide us many of the benefits and comforts of the modern world. Unfortunately, they had many unexpected side effects. These effects have been ignored or discounted by the industries dependent upon these chemicals. 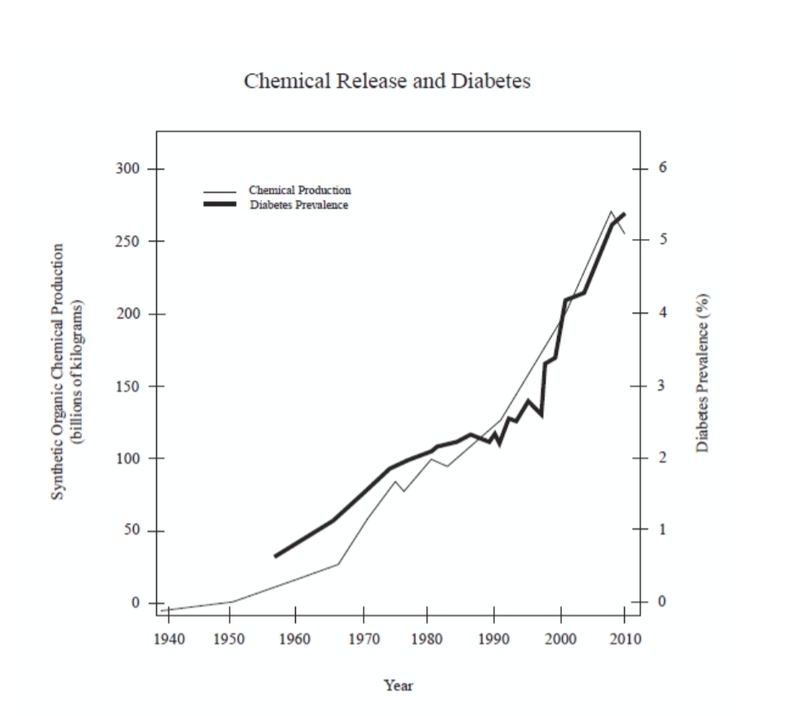 As you can see from the following figure, the diabetes epidemic correlates closely with the growing presence of toxins in the environment, food and even health and beauty aids. The purpose of this website and The Toxin Solution is to help you understand how toxins are damaging your health, where they come from, how to avoid them and the safest and most effective ways to get them out of your body.